As modern life gets ever more hectic, we all need a stress-free zone where we can relax and shut out the world. Most of us spend up to a third of our lives in our bedrooms, so it makes sense to instil a tranquil vibe in this space. It may sound obvious, but where you place your bed is very important to creating a comfortable bedroom. For early risers it is best to have your bed facing the window so that you can wake to the bright sunlight. For the night-owls amongst us it is more relaxing to have the bed on a wall adjacent to the window. Consider installing black out curtains if the early morning light in summer wakes you up. It is also important to buy a high-quality bed. Mattresses made by hand will give you the ultimate nights’ sleep. 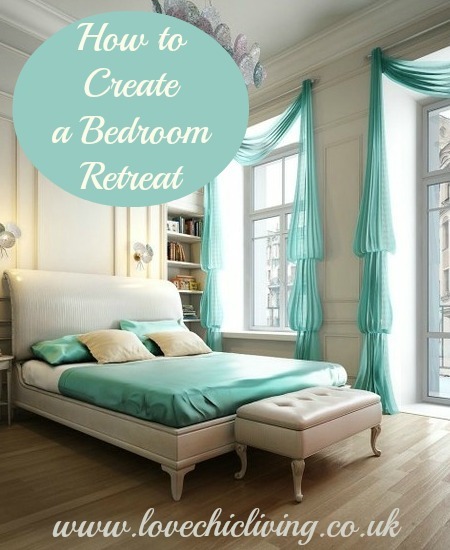 In order to be a retreat, your bedroom must be truly calming and relaxing. Light coloured walls can help set this mood. Light blues and greens are especially calming. The walls, carpet and curtains or blinds should all complement each other. Complicated patterns or hot colours are only going to agitate you on a subconscious level. It’s hard to get away from it all when you can’t move without falling over something. If furniture or objects don’t contribute to sleep, easy living and relaxation, move them to another room. Retreats should be light and airy, not full of boxes, dusty bookcases and piles of clothes on the floor. Under no circumstances should you have a computer or work desk in your retreat; you’re trying to chill-out, not get worked up about your boss’s last email. Also, you may be wondering whether or not to have the television on in bed? The best answer is to remove the TV entirely. Make sure you have a duvet suitable for the season, and keep additional duvets and clothing under your bed in storage containers. Storage containers in the closet can get rid of clutter without taking up a lot of space. At the end of the day, you must make your retreat work for you. That means picking the right colours, furniture and lighting that will help you relax. But the main points to remember are to keep things simple, clean, tidy and light. I also think that removing the TV from the bedroom works for you. Because the TV just consumes the space and has no function in the bedroom. A few years ago I got a mattress designed for my body. Took account of weight, where I get stiffness in my back, what position I sleep in, etc. Before this I’d sometimes wake up feeling vaguely uncomfortable and with a twinge or ache in my back. No more! Wish I’d done it years ago. We are into the mode of renovating the entire home. This is how I landed at this post. I was looking for some nice and peppy ideas for the bedroom decor, and my desire was fulfilled after reading this post. Thanks for sharing the nice tips. Much appreciated.